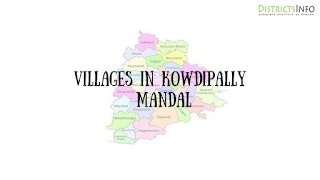 Kowdipally Mandal with new villages in Medak district: Kowdipally is a Mandal in Medak District of Telangana State. 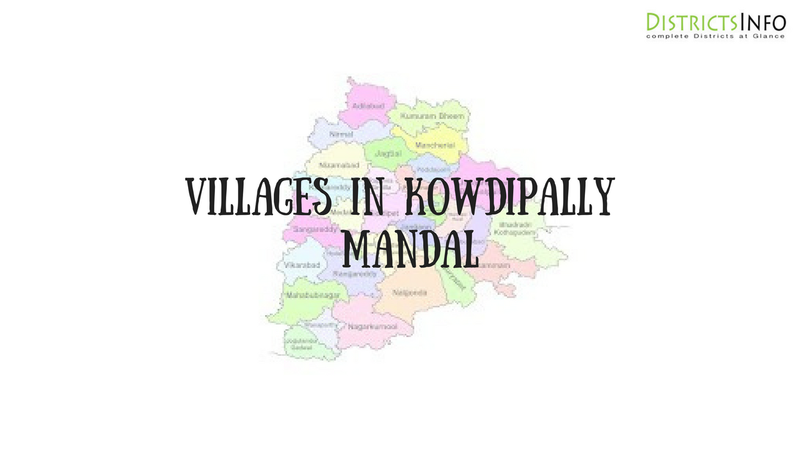 Kowdipalli Mandal Head Quarters is located in Kowdipalli town.Kowdipally Mandal is bordered by Kulcharam Mandal towards North, Andole Mandal towards west, Narsapur Mandal towards South, Yeldurthy Mandal towards East. Medak City, Sangareddy City, Sadasivpet City, Singapur City are the nearby Cities to Kowdipalli.It consists of 22 villages.We have listed here, Venkatapur, Kukatpally, Devalpally, Kowdipally, Yelmakanna, Kanchanpally, Dharmasagar, Kannavaram, Lingaraoguda, Dasguda, Bujarampet, Mangalpally (DP), Seri Faizabad, Mohammednagar @ Munirai, Thimmapur, Nagasanpally, Rajilapur, Thunki, Mutrajpally, Rajpet, Venkatapur, Salabatpur.Also, check Narsapur Mandal villages.